First, the really important news: Captain Bones hurt his right front paw and has been hobbling for the past week but he's better now and putting some pressure on the foot. I think Lisa would have preferred him somewhat immobile indefinitely so she could growl at him with impunity. Or, better yet, gone permanently! I've been working on getting the CD ready but the Linda gave me a call last week saying she needed me to manufacture a bunch of discs 'by tomorrow.' That would be of one of the concert recordings I did for her. Naturally, I can't get them done quite that quickly but I did drop everything and dedicate a day and change to getting them out to her. Steve always tries to be accommodating, especially where Ms Garcia is concerned. If my schedule had permitted, I would have driven them up to Tuskegee and delivered in person, but she'll have to be content with priority mail. 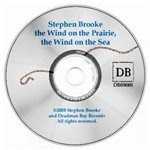 Anyway, my own CD -- I dropped the silly working title of the Surf and Turf Album in favor of the Wind on the Prairie, the Wind on the Sea. Essentially, I combined two older recordings into one, complete with all their faults in performance and recording. This is essentially a test to see how the whole print-on-demand thing works for CDs; if it's acceptable, I'll get newer material up. Eventually! The art work is all uploaded and the disc goes out in today's mail. Btw, if doing this at Cafe Press proves to be a good choice, I may well go back to having a 'premium' shop there, with all my merchandise in the same store. And now for my grumble of the day: we're getting Turner Classic Movies free this month (yeah, I'm still on satellite, but maybe not much longer) and I happened to catch a 1965 television special, a concert by Frank Sinatra, last night. Frank still impresses. Where are the singers who can match him today? Oh sure, there are loads of beautiful-but-boring voices out there; there were during his heyday too, but they are mostly forgotten now. It takes more than flashy technique to be a great vocalist!